My personal thanks to Andrew DeVigal and George Frederick for addressing students and professionals at the Society of Professional Journalists’ Spring Conference today in New York City. Andrew demonstrated the New York Times’ recent accomplishments in interactive storytelling, and explained the efforts and skills that go into merging audio, video and motion graphics. 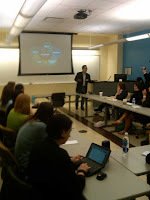 He emphasized how when done correctly, interactive forms can bring greater texture and understanding to complex issues. George, innovation editor of the Star-Ledger, New Jersey’s largest daily, was candid about the mistakes he has made designing the paper, particularly in his early days there in the mid-1990s. He admitted copying freely from other papers and creating a mishmash of a design. He advocated instead designing from the “inside-out,” taking care of the minute details before attacking more obvious things like the flag. Citing an essay on poetry-writing from Edgar Allen Poe, George said that good design is tied to an overall goal and is strategy-driven. Colors, font choices and questions of scale all fall into place when you have a strong sense of the mission behind your design, he noted. 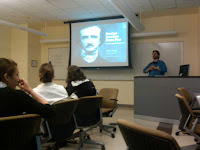 So then, thanks to SPJ for letting us evangelize on the gospel of design this morning. Thanks must also go to Chris Courtney, SND education and training director, who found these excellent speakers and persuaded them to spend a beautiful spring Saturday morning with us. Finally, big, big thanks to Jamie DeLoma, our hero of the day, who solved the technical problems that almost prevented our presentations from happening at all. Don’t even ask me how he did it, but the intrepid Mr. Deloma came through. A final note about the CUNY Graduate School of Journalism, on West 40th Street in Manhattan: We were gathered in some hallowed ground, the old headquarters of the famed New York Herald-Tribune, which was home of many influential journalists and cutting-edge designers until the 1960s when it folded. Only its Sunday supplement remains, Clay Felker’s New York Magazine, one of the most respected regional titles around.Today the building is fresh and new, with a student newsroom and broadcast facilities, not to mention the high-tech classrooms that we used today. Tributes to the old Herald-Tribune are scattered around the campus in murals and display cases. It’s worth the trip, and easy to find — it’s right next door to the new New York Times headquarters and behind Parson’s New School of Design.